10% to 25% Discount Code ws032!! 10% Discount on A523 with booking code ws032!!! 3) Give booking code: ws032. Waterscape is known for being one of the most family friendly Resorts in the Ft Walton / Destin Area. The tropical lagoon, pools, waterfalls, islands, lazy river and toddler splash park are just a few of the amazing courtyard features. The resort is right on the beach and was built with kids of all ages in mind. In addition to the tropical pools, the courtyard is well equipped with seating and shaded tables, has several gas grills and even a tiki snack and refreshment stand. If you feel like venturing out, there are a variety of restaurants and shops within walking distance of your beach condo. Where the courtyard ends, the beach begins! Enjoy the white sand beach which is just steps from your Fort Walton Beach condo. Waterscape has 490’ of spectacular beach front which is accessible from the lower courtyard. 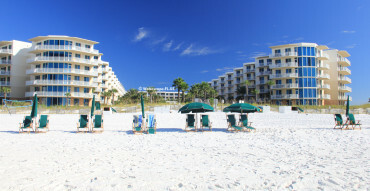 Chairs and an umbrella will be set up and waiting for you (free 3/1-10/31) when step onto the sugar white sand beach . You can stay close to the complex and enjoy the clear emerald surf that the area is famous for or venture to some of the nearby attractions, shopping and dining. Florida’s Gulfarium aquarium is a short ¼ mile walk down the beach. They are known for their shows and for their interactive ”encounters” with dolphins, sting rays and seals. The Pier and Boardwalk which feature several restaurants and shops are also short walk down the beach. No complex in Fort Walton or Destin can beat Waterscape! 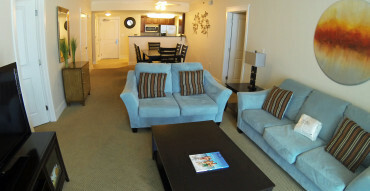 After a day of fun at the pools and on the beach, come back to your luxurious Waterscape condo. Floor to ceiling glass doors provide access to your spacious 8’ deep balcony where you can relax and enjoy the views of the gulf. The condo easily accommodates 8 people and the layout works perfectly for multiple or large families. There are two complete master suites. Each suite has a king bed, a private attached full bathroom, private access to the balcony and an HD flat screen TV. There is also a separate “bunk room” for the kids. Finally, the upscale kitchen is fully equipped and nicely finished with granite and stainless.